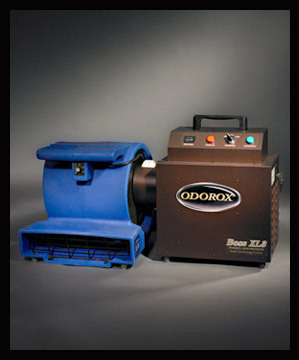 The Odorox® Boss XL3 is a more powerful but fanless model designed for use with an existing air mover or drier (NOT included) (NB. A minimum 2,500 cfm fan capability is required to activate the Boss XL3). The Boss XL3™ unit provides a high yield of hydroxyls to treat large areas affected by fire and smoke, flood, nicotine, grey/black water, decomposition, mould, sewage, chemical spills/off-gassing and any other odour problem you may encounter. The Boss XL3™is able to perform in up to 4000 sq.ft. (400 sq.m.) of contaminated space, assuming a 9ft/3m ceiling, and possibly more depending on the air mover. It is equipped with a selector switch for use with 2 or 3 Odorox® hydroxyl generating optics and operates using only 1.6 Amps. Odorox®, Boss XL3™ and HGI Industries Inc. are either registered trademarks or trademarks of HGI Industries Inc. of Boynton Beach, Florida USA. Other trademarks are pending in the U.S. and other countries.